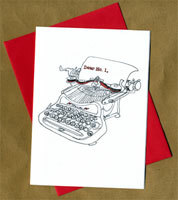 A lively drawing of an antique typewriter taps out a valentine missive that begins, "Dear No. 1,". Inside the note continues with "You are just my type. Happy Valentine's Day. xoxo." Much more romantic than an e-mail, don't you agree? You may also choose to order this as a "plain" old love note (is there such a thing?) and order the card with the greeting as "You are just my type. xoxoxo"
4 1/2 x 6 1/4 card is printed on heavy white stock and comes with really red envelope. Sets of eight cards come in kraft box with clear lid and raffia tie.